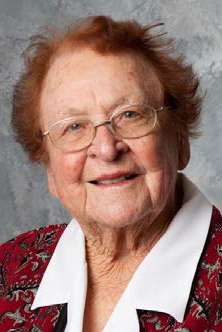 Marian Kneer has dedicated her life to education and athletics, working as a proponent for physical education in schools for more than 60 years. She worked for the inclusion of females in sports at the national level, actively pioneering the inclusion of women’s high school sports before the passage of Title IX. An athlete herself, Kneer was a premiere catcher for the Peoria Caterpillar Dieselettes in the 1940s. She was heralded as the “world’s greatest softball catcher.” She went on to author many books and articles in the world of athletics and physical education. Kneer has been honored repeatedly and is a member of the ISU Athletics Percy Hall of Fame, ISU’s College of Education Hall of Fame, the Illinois Softball Hall of Fame, and the Illinois Coaches Association for Girls and Women Hall of Fame. She served as president of the National Association for Sport and Physical Education and the Illinois Association for Health, Physical Education and Sports. She has been inducted into the Hall of Fame for each association, and awarded their highest honors. Kneer is a generous donor to ISU, with the Marian Kneer Softball Stadium dedicated during the 2009 season.